One of my heroes is Joseph Martin-Dauch. He was the only member of the Estates General to refuse to sign the Tennis Court Oath. 576 voted for it and 1 voted against it – Joseph Martin-Dauch. 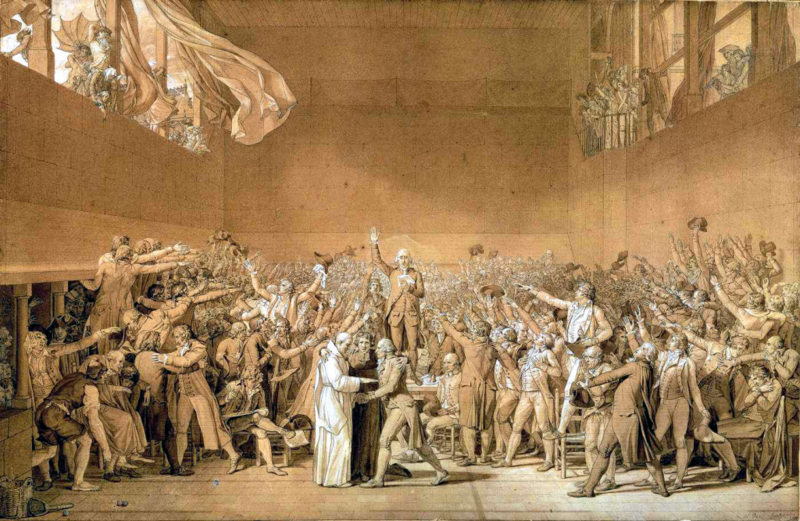 The scene was captured by the painter Jacques-Louis David. You can see Dauch seated to one side while everyone around him raises their hands in a salute – a symbol that would later come to define European fascism. Martin-Dauch was commanded not to publicly express his opposition to the National Assembly. But he defied the wishes of the assembly and wrote the word ‘opponent’ next to his name on the Oath. Martin-Dauch was commanded to stay away from the Estates General, but he attended anyway. And he was the only one to stand when king Louis XVI entered the hall. 576 remained seated and 1 stood. Martin-Dauch was not afraid to go against the crowd even though it cost him dearly. He survived one assassination attempt and spent time in prison. The only way he survived the Reign of Terror was by going under a false name. When I look at Martin-Dauch seated there, I think of Jotham, Nathan, Elijah, Isaiah, Jeremiah… men who stood alone. They are the only ancient historical figures I am aware of who openly challenged the will of the king until Aristophanes criticized Cleon in the 5th century BC. Even so, Aristophanes had to couch his criticism in satire. How many refused to go along with Antiochus IV’s attempt to create a state unified by one Hellenistic religion and culture? Just a few Maccabeans. How many refused to sacrifice to Roma and Augustus? Just a few Christians. And what of our day?